An 18 year old middle class Indian youth is often troubled by only two factors: Doctor Engineer Syndrome and What will Sharmaji say about his career decisions! Doctor-Engineer Syndrome is the tragic, vehemently agreed view in India that only those who end up becoming an Engineer or Doctor can be considered as a success. Entrepreneurship is considered as a gamble by majority of parents in India; because of the high failure rate, absence of any assured income stream or salary and absence of any support system. Yes, entrepreneurship is all about taking that leap of faith and doing what you believe in. But how can this mysterious yet enchanting endeavor explained to a parent of a teenager, who wants to become an entrepreneur? 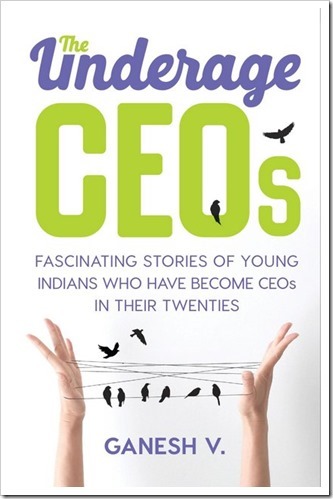 ‘The Underage CEOs’ by author Ganesh V. can be described as one of those references, which one needs while explaining the magic of entrepreneurship to the non-believers. In this non-fiction book published by Collins Business, an imprint of Harper Collins Publishers, Ganesh V. showcases 11 inspiring stories of student entrepreneurs, who resisted every form of pressure, challenges and disappointments to start their own ventures, and became entrepreneurs. The best part of this book is that both parents and aspiring young entrepreneurs will find it interesting, full of hope and answers. Some of the questions which this book attempt to answer: How does entrepreneurship work, what is risk, how funding works, how can an idea be commercialized for profits, what if the venture fails and more. As per Ganesh, this book has been written for 20 something youth of the nation, who understand that entrepreneurship is rocking, but are afraid to take that final plunge, owning to less information about the whole deal. In a non-biased way, the author takes us through the stories of these 11 youths, pokes the pros and cons, provides the reader with insightful thoughts and opinions, which can make motivate and inspire the reader to break all shackles. Debunking the myth that entrepreneurship requires a special pedigree or location based advantage, the book covers fascinating stories from Kolkata, Hyderabad, Pune, Mumbai, Bengaluru, Hubli, Delhi and even from a non-descript city called Brambe in Jharkhand. As if to reassure all budding entrepreneurs that technology and programming are not the ‘only’ niche to explore, the author has covered inspiring entrepreneurial stories of startups in educational sector, agricultural sector, biotech niche, social works & digital sector. In the end, the author provides a ready-made, easy to understand ‘Fundas of Funding’, which provides the perspective of an investor and entrepreneur, an instant guide to create business plan and a treasure of resources which can help the new, young entrepreneur to kickstart his or her project. 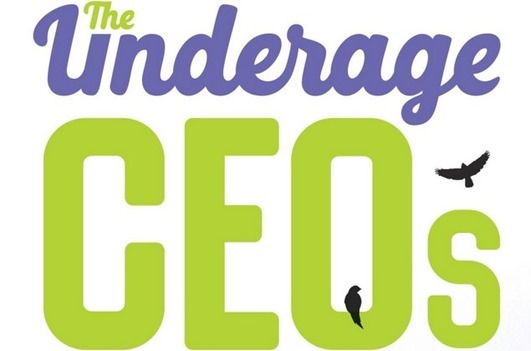 ‘The Underage CEOs’ can be summed up as an inspiring, motivating and useful reference guide for the young and restless brigade of entrepreneurs; and at the same time a factsheet for their parents as it unveils the magic of entrepreneurship in the most efficient manner. "‘The Underage CEOs’ Will Convince You That Entrepreneurship Is Indeed Magical [Book Review]", 5 out of 5 based on 3 ratings. Ordered a book from Amazon.in, was delivered within 40 hours… As for the book you can read it over and over again and still learn something new. Would definitely suggest buying it. I find myself picking it up and rereading certain portions because they’re so meaningful. thanks for the review and your kind words. As the author of this book, I am happy that you have picked up my thinking behind this book and the effort I have put into it. Glad that you think it will inspire youngsters and also help bring about a change in the mindset of their parents.